A setback is the minimum distance between an industrial wind turbine & a “dwelling”. In Ontario, the minimum setback for new projects is 550 m from non-participants. There is no setback for participants. Older turbines are even closer than 550 m. Municipalities have no control over the setback in Ontario, unlike other jurisdictions. The setback is arbitrary, not “based on the most up-to-date science”. Please contact Denise if you have updates/additional setback info. Here are many more North American setbacks that are more stringent than Ontario (and some from other countries). 350 metres (1,148 feet) in theory (stated in draft legislation, but never voted). In practice the developers avoid problems by making it no closer than 500 m (1,640 ft), although many turbines are as close as 150 m (492 ft). There are no regulations on setbacks from wind turbine. In practice: 400 m to 800 m (1,312-2,625 ft). Windmills must be situated at a minimum distance of 4 × their height away from habitation. If the windmill is erected closer than 6 × its height, an estimation is carried out free of charge regarding the depreciation of the property value. If the loss is more than 1%, full compensation of the loss in property value is paid out. If the property is situated farther away than 6 × the height of the windmill, 4,000 DKK is payable to have an evaluation of the loss in value carried out. If it is estimated that the depreciation is more than 1%, the loss in value of the property is paid out and the 4,000 DKK reimbursed. If it is estimated that there is no loss in value of the property, the 4,000 DKK is forfeited. Owners of windmills have to pay the compensation. On a case-by-case basis, only limited by noise legislation. The French Academy of Medicine recommends 1,500 m (4,921 ft). This is not respected, however. In practice, 500 m (1,640 ft) seems to be the minimum observed. All makes and models of wind turbines are not equally noisy, hence the lack of a precise distance. Some states have standards of their own. Setbacks are determined by regional authorities. Some regions have defined setbacks, others don’t. Calabria and Molise: 5 × the height of the turbines (not specified if mast or total height). Basilicata: 2 km from urbanized areas. Campania: 10 × the turbine height from urbanized areas. Molise: 20 × the turbine height from urbanized areas. In practice, they use 4 × the height of the mast of the wind turbine. This is not a legal setback. The legal setback is linked to a maximum noise level [40 dB(A)]. New limits are proposed and in discussion at this time and a possible change of setbacks is expected to become law in the middle of this year (2009). The setback is 3 × the height of the mast, and this distance may be shortened with the approval of local communities but not shorter than height of the tower + length of blades + 3 meters. So far, this appears to be the European record on the nuisance scale. Addendum, April 18, 2009: The Stop Highland Windfarms Campaign wrote to Jim Mather, Minister for Enterprise, Energy and Tourism, for clarification. In reply, the Directorate for the Built Environment wrote: “The 2km separation distance is intended to recognise that, in relation to local communities, visual impacts are likely to be a prominent feature and this should be taken into account when identifying the most suitable search areas. However, impacts will clearly vary considerably depending on the scale of projects and the proposed location. That is why SPP6 confirms that, in all instances, proposals should not be permitted if they would have a significant long term detrimental impact on the amenity of people living nearby. This principle applies to houses within and outwith 2km of the proposed development and regardless of whether they are single dwellings or part of a settlement.” Click here for a copy of the correspondence in full, by courtesy of the Caithness Windfarm Information Forum. – Valencia: 1,000 m (3,281 ft) from any piece of land that may be built upon. The only limit is the noise level [40 dB(A)]. In practice, 500 m (1,640 ft) seems to be the setback applied, but there are exceptions (350 m [1,148 ft] in one case). I am told there are regulations for shadows. Documentation from Suisse Eole (quango promoting windfarms) mentions 300 m (984 ft) from the tip of turbine blades of a 70 m (230 ft) turbine. But each canton is still working on a clear setback policy. Sound levels are measured leaving out the other factors associated with sound/noise like distance that noise can travel, convergence,dead zones ,number ot turbines involved,size of the turbines,etc. Government limits the sound/noise issues to decibles only. Page 4, shows Ontario recommended setbacks from research conducted by the Ontario government were/are 550m to 1500m based on several variables. However these guidelines are completely ignored by the Ontario government. turbine site plan with minimal logistical problems. and/or are in the planning stages. The most important issue was to be able to fit as many turbines in as possible considering the 100 acre farm lot sizes and more densely populated areas they would encounter in many key locations. The objective is to have IWTs supply a predetermined amount of electricity and this can be achieved using different size IWTs. One solution is to install very large turbines in place of smaller turbines so setback distances need to be closely watched. Another factor is the way the land was laid out in rural Ontario. Most of the land was laid out in rectangles 6600ft or 1.25 miles across with 66 ft concession roadways. Then there are line roads that bisect/divide the large land rectangles. 2kms /1.25 miles might be enough space between concessions to install turbines every other concession. Have used “feet” & miles because this was the original way the land was laid out. These measurements are still valid today when dealing with property. Most farms in the States,under the Homestead Act, were laid out in 1 sq.mile plots/sections with 4 farms of 160 acres each. This presents different siting issues than Ontario has. huge tracts of uninterupted leased up property. So let’s take an obvious case where this definition is in my view a real problem. Say that I purchased a large property that has a very ratty old house on one corner of it… what in real estate terms is called a ‘pushover’. However, the property has some wonderful other locations which are quite attractive to build on including a nice spot on a far corner that is approximately 800 meters away from the pushover house. What I originally intended to do was put up with the pushover until my new spiffy house is built. In the meantime, some IWTs were approved that would be well over the 550 meters from the pushover house but well within 550 meters from where I want to locate the new house. This would seem to elicit a whole bunch of questions: 1. Are IWT permits prevented from building where a dwelling could potentially be located? Or only from where they actually are located right now? 2. What does a homeowner have to do to assert a right to be able to build anywhere he/she wants to on the property….within the confines let’s say of what would have been ‘existing building code requirements’? Existing zoning laws operate on a principal of ‘separation distances’ between the distinctive zoning allocations of residential, commercial and industrial ….. but it would appear that IWTs have some superseding rights here that dictate what existing property owners can do to their properties in the future. At least, it would seem that if one tried to take out a building permit to build a house in a location that is now within under 550 meters from an IWT, the building department would have to refuse to give it to the property owner. Is this really the case? If so, it would seem that there is essentially no protection for the homeowner to do what they want with their property. Marty, There is no property line setback distance in Ontario. The setback only applies to currently inhabited dwellings. And the Ontario government does not always follow those laws. There are currently turbines under construction 400m from homes and in some cases much less. Pre GEA approvals. You really don’t want to be close to these things, at least 5km and likely a lot further. I meant to add one more thing…. I believe that any noise study that I’ve seen looked at what the noise would be at the noise ‘producer’s’ property line even if there was nothing of ‘value’ on the other side of the property line such as a dwelling, an office etc. This approach recognized that in the event that something of value was built on the other side of the property line in the future, the owner would be protected by provincial environmental laws or possibly municipal bylaws. From what I am hearing, it would seem that IWTs are a protected class that doesn’t have to abide by these laws… Am I wrong concerning this? I encourage you and your followers to download my eBook and read it and use the material in it as reference material. Although my book is from the American perspective and largely about wildlife impacts, the book is based on researched and referenced material, as well as my own personal concerns about commercial wind farms. I plan to continue to produce revised copies of the book as additional information and research becomes available. Good luck with educating the public on commercial wind energy issues. Dan, Thanks for commenting here and letting us know. Your book looks great, I will read more when I get a chance. We have all of the same problems here in Ontario. The same everywhere I think. I have tried several times to access your book with no luck. Is it possible that the link is copied incorrectly? “Commercial wind farms”? Does this mean that you are for other types of wind production Dan? I thought we were against wind farms/wind turbines..period! I have nothing against someone having their own small wind generator for personal use (off the grid) as long as it doesn’t impact the neighbours. I am only against industrial wind development. I know someone who tried to use wind to supply electricity to their home and gave up as it never blew when convenient and the price for batteries, etc were ridiculous. I wouldn’t recommend anyone doing it … but if that what they want to do, all the power to them. I agree. There is a niche for small independent wind generators. If they do not impact on the neighbours and individuals want to expend their own money for them then that is up to them. It is the large industrial settings that I oppose for a variety of reasons. I have a question that I hope someone out there can help with. What are the setbacks for turbines from municipal aerodromes? All I could find was 1500m from end of runway. 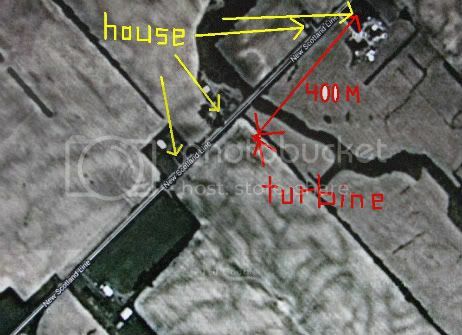 I believe my neighbour got special permission to have his “airport” 1000m from turbines. Does this mean straight from end of runway or is there a broader sweep and not just straight line. This is in Dufferin County of Southern Ontario. Thanks for any help. Marion, I do not think there are any laws that are ever followed. Try contacting the Collingwood airport. We have stumbled into the most misunderstood component of the GEA, that being ‘setbacks’. David Libby points to a couple of great references that should be read closely to gain an understanding. He rightfully points out that the MOE has created an array of setback distances from 550 m to 1500 m depending on the sound levels of each turbine and the number of turbines in the project. In addition, these setback distances are regularly violated in each approved project (i.e. Kent-Breeze, Conestoga, Zephyr, Gesner). The reason is that distance from a receptor is not the criteria for approval. It is noise levels! As long as a proponent can prove in a noise assessment that noise levels do not exceed 40 db(A) at any non-participating receptor then they are in compliance; regardless of the distance. That raises the immediate question of the infamous 550m setback. However, that is a moot point. The reason is that the 40 db(A) limit around turbines occurs at usually well in excess of 600m. Therefore, for a non-participating receptor to be located at 550m the noise level would be greater than 40 db(A) and not in compliance. You may not be aware but in every one of the above mentioned approved projects there is not one single example of a turbine located at 550m from a non-participating receptor. As one example, the Conestoga project- the closest turbine to a receptor is 723m. Oddly, it is not the loudest. The loudest turbines are located at 810m, 975m, 875m, 859m, 998m from receptors. All of these circumstances are easily explainable along with other examples you will find in every project where turbines at the same distance from receptors have significantly different noise levels and turbines of drastically different distances from receptors have the same noise levels. Suffice to say that distance alone as a key factor in protecting the health and well being of rural Ontario is woefully inadequate. There is a desperate need to understand the ‘sound scapes’ of how projects are constructed to make a positive contribution. Obviously the noise models aren’t working and ye they are they still being used! Hi Dan, Many folks talk about the ‘models’ as something that was made up in a computer for turbines. Nothing could be further from the truth! The sound attenuation model used by all proponents at the direction of the MOE is ISO 9613-2. 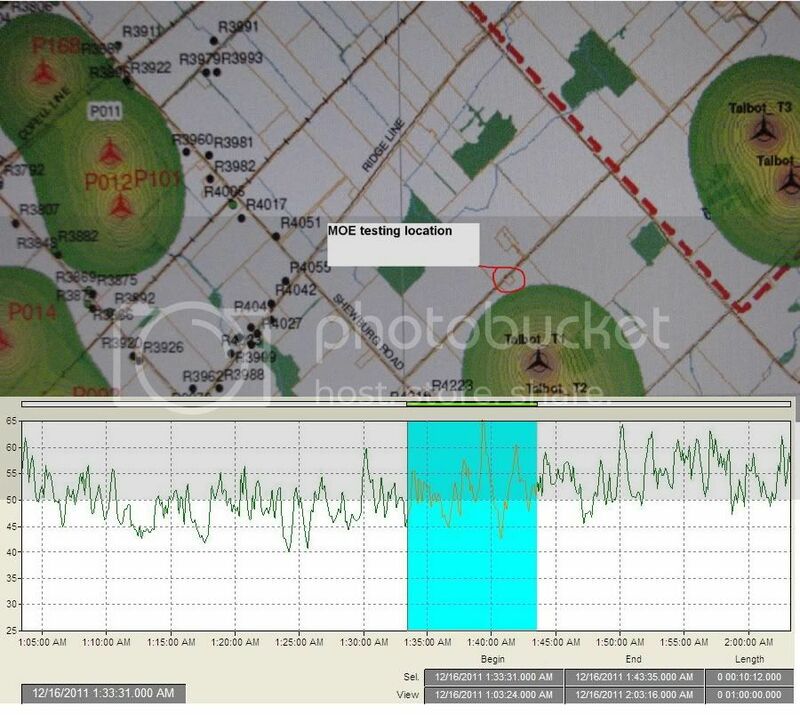 As the name implies it is an international standard used around the globe for noise predictions for ‘any stationary industrial source’ So…any factory, quarry, airport and sometimes transportation corridors who acquire a Certficate of Approval based on noise propogation use this model. That is not to say it is flawless. It is based on a series of assumptions and when reality deviates from the assumptions then the predictions of the model won’t hold. But they are exceptions as opposed to the rule. Consequently, rather than think the model is the problem and argue with worldwilde organizations of professional engineers and accousticians, assume the model is accurrate. It is the conclusions of the model that are dangerous to people. That is, it is not how it is calculated that is the flaw its the fact that 40 db(A) is set as a reasonable limit for noise in rural environments. 40 db(A), even if it is never exceeded is clearly 10-15 decibels above most rural ambient noise levels, That magnitude of difference takes a noise from noticeable to intolerable from some people. Part of the problem could be that particular noise model doesn’t take wind shear into account which happens quite often at night. Wind shear is also the reason that nightime wind speeds are higher at blade height and hence IWT’s produce more power at nightime when it isn’t needed. Well said. Sound is a complex issue/many factors that decibles alone do not explain but the government would like people to think in terms of decibles only. Hi Barb, To the best of my knowledge decibels is the only measure of sound. Having said that the MOE has chosen to use only one type of decibel for turbine projects. That is ‘A” weighted. It could be suggested that this is a logical choice because it has been used for decades in noise issues to measure those frequencies of sound that can damage human hearing. It is the standard for workplace health and safety. It does have limits of which the most well known is how it understates noise levels in the lower frequencies. There are however other ‘weighting scales’ for noise such as ‘C’ weighted and ‘G’ weighted decibels that more accurately assess low frequency noise and infrasound respectively. However, neither is employed with turbine projects. There was never any model used for actual setbacks. They just drew circles around the turbines. If their circles didn’t fit in between the houses they drew smaller circles. If that wasn’t going to work they ignored the location on the map and just built the turbine where they wanted. I have some various noise model maps. I can sent them if anybody want them. The maps have examples of all of this. By all means publish these. Maps are of great value as they provide visual information that words alone can’t supply. If anyone else wants maps sent please contact me. Yes, decible is the measure but there are many more unmeasured factors that enter in here. Not just dealing with noise/sound inside of buildings. How the sound behaves in the atmosphere also needs to be considered. Just want people to be aware of the complete sound situations that can occur under varying circumstances. Sound can be absorbed,echo & etc. The atmosphere/air changes depending on weather factors.There are convergence factors. So IWT siting is more guess work than anything else. Let me try to cover a few issues in this note for the points made above as this may be my last attempt to offer information. First: Thanx Dan for the notes on wind shear. I am familiar with the concept and the impact. In fact, it is considered in the modelling under a ‘wind shear co-efficient’. All turbine manufacturers are very forthwright with the differing noise levels from ground to hub height which are applied and accounted for when predicting noise. However, that doesn’t rectify the problem because the 40 db(A) limit for a Class 3 area set by the MOE is based on wind speed of 6 m/s. Therefore they always assume noise at ground level. Nightime noise becomes most audible when there is no wind at ground level but wind aloft(shear) and therefore the noise aloft is not masked. Even though noise can be accurately predicted at hub height its effect is understated when there is no wind at ground level. Second: David your statement about no models for setbacks is inaccurate. You can find exactly how it has been used for each of the 12 minimum setbacks the MOE created if you look at ‘Development of Noise Setbacks for Wind Farms, Sept 2009 on the MOE website. If anyone is interested in maps you can find an ‘iso-contour’ map associated with any appproved/proposed wind project in the province on the internet. They are included as part of the detailed noise impact assessment for every REA submitted when a turbine is positioned within 1500m of a receptor. What they show are the predicted noise envelopes around each group of turbines; where the 40 db(A) boundary occurs and the location of all turbines, participating and non-participating receptors. Third: The modelling of noise required for each wind project doesn’t deal with with noise inside buildings. It is only focussed on outdoor levels. In that regard the modelling uses parameters for; atmoshperic attenuation coefficients for temperature, humidity, coefficients for atmospheric absorbtion across frequency from 63 hz(low) to 8000 hz(high), ground attenuation coefficients for both topography and vegetation in the source region(where turbines are located), middle region & reciever region plus wind-shear coefficients as I mentioned earlier. Please don`t take my word for any of this. Take a look at both the document mentioned earlier and `Noise Guidelines for Wind Farms` Oct, 2008 which you can also find on the MOE website. I do not disagree with anything that you wrote. I appreciate that you took the time to offer the information. Concerning the models, I think you are refering to something like the first link below. A legitimate attempt at a model. Most of the counrty side is blotted out. In the case of Chatham Kent 100s of square km. These types of maps were always keep out of sight of the public. What was available to public, but certainly kept quiet as well was a map similiar to this link. I have added a graph with real noise measurements 40-65 decibel. There may be a model invloved but all they have done is mark cirlces around the turbines. Two exact same turbines will have different sized circles (if the whole map was shown). Based on what? – fit them between the houses. And then if there was no way to make to make a turbine fit they just threw something on the map and then ignored it for actual construction. This one has been moved 300-400m N or NW. Four houses 200-400m away. I went into your photobucket and copied the html code instead of the email link. Seems to work. OWR, thanks. I think you can do it because you are the boss! I will try it another time. A picture is worth a thousand words. I am busy working on a scathing letter to MOE, in response to letters that have been sent to me. I will forward it to OWR when complete. This map is fantastic! Do you have more of them? Greg Fauquier,Managing Director Hatch Energy > Barrick Gold Corp.
Also view some of the other officals,directors & big boys. Riverstone Holdings LLC aquired Pattern Energy Group June 2009. John Philip Browne, Partner & Managing Director Riverstone Holdings > John A. Manzoni, CEO Talisman Energy > Dambiso Moyo, Board of Directors, Barrick Gold Corp.
Riverstone Holdings LLC. News articles about pay to play in New York. Riverstone Holdings LLC, John Philip Browne, managing director and partner. On Campobello Island NB, a quiet, peaceful favorite place for tourists to find tranquility, security and beautiful scenery including the wonderful bay of Fundy, A US land owner has initiated the backing of a US industrial wind turbine company who secured the backing of our local rural community council – without their coming to the small community of Welshpool, New Brunswick, including the residents, property owners and tax payers who are in the setback which is on average .54 miles from the turbine location for our opinions. A tourism related motel is situated almost beside it! Tourism is our largest growing industry with the exception of fishing. The council rammed the project through without our consent or knowledge. When we approached the Mayor and our district councilor they simply ignored our voices of protest, information we had compiled (bone fide and credible) and kept on proceeding. We are outraged because we live here with some inconvenience on a tiny nine mile island connected to Maine (Canadian Island) & must travel through Maine for about one hour to get back to our own country, St. Stephen, NB. Point being we love it here & because of the peace and quiet. My husband is a thirty year veteran of the Canadian Armed forces (Air Force) with a stellar career with commendations and who retired as a Chief Warrant Officer. He was born here. He sustained a severe ear injury due to his trade which included explosives, bombs etc and which he taught demolition etc to the military troops and the RCMP. Now in his later years, he struggles with Meniere type symptoms, and cannot bear to be around noise. We have put our equity in our beloved home, making many improvements as recently as last summer. Now we are going to be existing in the too narrow setback and our whole lives will be ruined. Because of the devaluation of property we cannot even sell at a fair market price, and at this stage in our lives, it is outrageous to have to be forced to move, lose money because of the lack of diligence and care of our elected representatives who are in place to look after our interests. 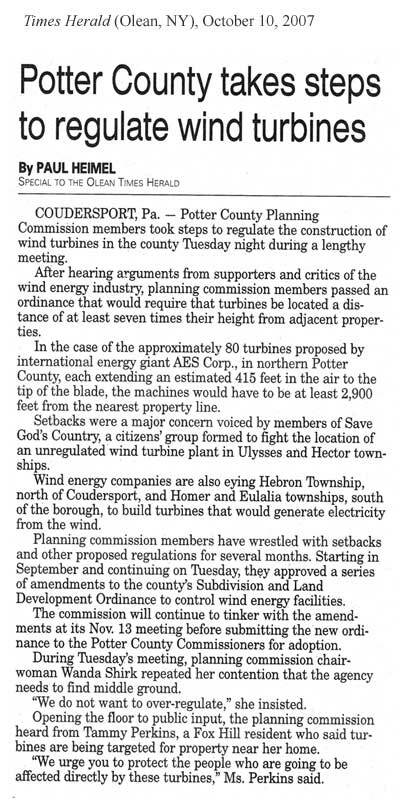 There also appears to be a personal conflict on interest in this, as well as our local district representative voting for approval of the project and then proclaiming that she did not know anything about industrial wind turbines! We have used the tools and submitted amendments to the zoning laws which have never even been recognized. And, we have a petition on the island being circulated which is gathering steam however on this island, there are many folks who if they do not have a dog in the fight, they do not care unless they are affected personally. I recently resigned as president of the tourism association for which I worked many years, mainly because of one member who is actually pushing the turbine on her web site oblivious to the damage to her fellow tourism providers on this end of the island! We are doing all that we can to stop this project before it starts but our voices are falling on the deaf ears of our council. They have apparently ignored the guidelines which were put in place when the island became a rural community and in a dictatorial fashion have arbitrarily decided to ruin our lives. There are many houses impacted, tourism outlets such as a prestigious art gallery, motel, restaurant, hair salon, golf course, proposed marina, Country Inn, Church, Church Hall, Library etc. Five known residents impacted have inner ear problems! The narrow set back is the issue but the island is also in the Atlantic Fly path which is used by thousands of birds annually and who use the mud flats below our property as a resting ground before continuing their journey. Around the globe people are complaining (with justification) about the implications of the low level frequency and consequent health hazards, flicker, and so much more of which you are aware. We have contacted sufferers there who have had to move to the mainland. They are coming to speak next week. The problem is that we will be preaching to the choir as most people are not aware of the implications and blind to learning about them. The informed ones will attend the presentation of people who are going through this ordeal. The electrical bills in Vinalhaven actually went up after the turbines were erected and life has become unbearable for the folks in the setbacks. The UK has recently enacted a law of 3 km setback. Thanks for writing your story. Do not be disappointed if people don’t say much about the story you wrote. People feel uncomfortable talking directly to you about it. This is my backyard. It is becoming very common everywhere. This is all about money and the few people who have vested interests in IWTs. Damage done to other people & wildlife is only viewed by these people as necessary collateral damge. Veterans with ear/hearing damage from expolsives can just be damned. Barbara, I have a few more for Chatham Kent but they are the same as the picture with ‘MOE testing location’ except larger. The very top one with all of the overlapping noise areas, that is the only one I have. Better left to the people who can handle these kinds of computer tasks and the sooner the better. After looking at the top IWT sound map who in their right mind would buy any property in that area and with more turbines going in? Terrible for the victims who live there. A couple of ‘brief’ follow up points. What you are looking at Dan W in the 40 -51 db(A) stuff is NPC-232. It is the noise limits that the MOE allows at different wind speeds. Your interpretation is not completely accurate in that for a Class 3 area(rural) the ‘ceiling’ is the 40 db(A) limit at a wind speed of 6m/s. The proponent has to prove through the sound attenuation model (ISO 9613-2) that turbine noise will not exceed 40 dbA) at any non-participating receptor for approval. If it is over that limit then it is non-compliant and will not be approved. Here’s the interesting point; when the proponent models the noise levels of turbines they are required to model a ‘worst case scenario’ which means they model the noise level that would be created if the turbine operated at 95% of the power output capacity. For most turbines they do not reach maximum power output until wind blows from 13-15 m/s. Therefore, the noise level of the turbine at 95% of its power capacity is between 11-12 m/s. So in effect the proponent models noise output at the top wind speeds of NPC-232 and proves that noise won’t exceed 40 db(A) at a receptor. They accomplish this in two ways; first it is through distance. That’s why in every approved wind farm to date you won’t find a turbine as close as the infamous 550 m setback. Secondly, they do it through turbine groupings; clusters of turbines are noisier than more isolated turbines. Which leads to a second point on Dave L’s maps. The iso-contour map you see in the link is a pictorial representation of the mathematical modelling. They are ‘VERY’ public and easily accessible. If you go on to google and type the name of any wind project now approved (like Kent-Breeze, Conestoga, Gesner,) or an REA submitted awaiting approval (like McLeans Mountain) and then add to the name a phrase like ‘Detail Noise Assessment’ you will find a 15-20 page document that includes an iso-contour map like the one above. The ‘circles’ join areas of the same predicted noise levels and they are different shapes around identical turbines for a couple of reasons; One, turbine noise is modelled on a ‘cummulative basis’ That means that the noise predicted at a receptor is not just the noise from the closest turbine but rather from the closest turbine ‘PLUS’ every other turbine within a 5 km radius. 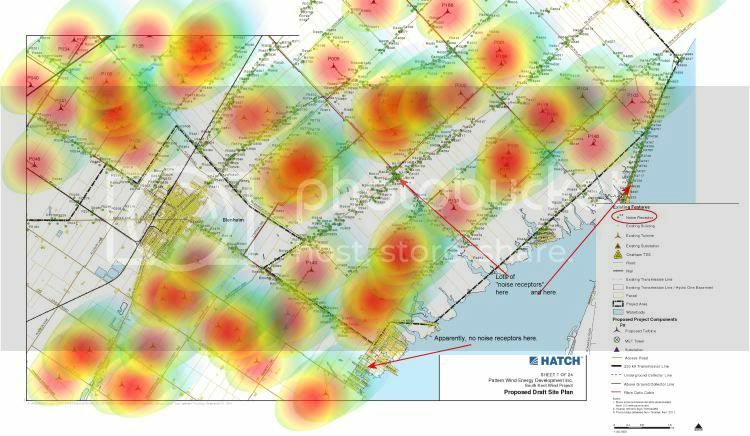 Hence you will see a number of different ‘noise envelopes’ like in the map above. When there are two or three clustered together the circles will be larger then for isolated turbines. Also, the circles can have odd shapes in view of the fact that noise carries a further distance downwind from a turbine then upwind. If you look at the Gesner project or the proposed McLeans Mountain on Manitoulin you will see iso-contour lines that show noise levels as much as 75-80 db(A) at about 100-200 m from a turbine. For those that choose to host turbines on their property they will regularly be exposed to limits from 40 db(A) and up, depending on how close they either work(as a farmer) or live to a turbine. The sad part is no one seems to be concerned. In any Detailed Noise Impact Assessment noise levels at “participating-receptors’ are not included for approval. In the recently approved Summerhaven project in Haldimand there are 19 participating-receptors and 3 of them have turbines less than 350m from a dwelling. The multi-coloured areas/circles on David’s map remind one of the top view of mushroom clouds from you know what. I fear I am not intelligent enough to understand a lot of what you are saying but definitely am trying. What I would like to know is do they take into account topography? I have turbines east of me and then the Grand River Valley then my house elevated above the valley. I have notice with other noises such as farm machinery and trucks on the highway one block away that wind direction makes a huge difference as to noise travel. It feels like East and West winds cause the noise to “bounce” (for lack of a more technical term) off my house. Most other properties in this area are fairly flat so it is hard to tell. I think I am one of the most affected this way. An feedback is appreciated. Indeed, sound does bounce off from objects. Have you ever been seated under a balcony and can’t hear anything thing that’s going on on stage? Objects can also absorb sound which then deadens the sound. In the case of light you would use the term light reflected back from objects. Kind of think of sound the same way you see light reflected, absorbed,how far it travels and how light beams can converge etc.. This will give you a general idea about how sound behaves. I am not an engineer nor in any way a scientist but seem to have too much time on my hands to read about this stuff(according to my family). I would suggest that my skills in trying to re-write what I understand is what leads to confusion. Certainly any confusion that you suffer from reading my notes is in no way related to your intelligence. In that regard I will do my best to address some of the puzzling aspects as directly as I can. If you are interested one of the clearest documents I have ever read on this issue can be found on the internet if you google ‘Propogation Modelling Parameters for Wind Power Projects’ by K.Kaliski & E.Duncan of Vermont. The short answer to the question about topography is that ‘yes’ it is taken into account when wind projects are modelled. You need to appreciate however what is actually being determined is the amount of ‘attenutation’ of noise due to ground conditions. That means they are modelling how much noise decreases from a source(turbine). In the modelling process ground attenuation due to topography is considered in three regions: source region, middle region and receiver region. However, how they define the size of a region is important. As an example, a source region is defined as ‘a region 30 times the height of the source’. Therefore for turbines of 80-100m heights the source region is sometimes 2-3 km. A reciever region is also 30 times the height but the height is much less and therefore smaller. The middle region is only considered if the source region and the receiver region do not overlap which is rare with wind projects. In the case of modelling a wind project in Ontario each region is assigned a value between 0 and 1. Zero(0) relates to hard ground with high reflectivity and one(1) relates to ground with vegetation and therefore more absorbtion. In the case of Ontario’s wind projects, the source region cannot exceed a value of 1 and the receiver region cannot exceed a value of .5. Proponents can use a ‘global universal value’ of .7. The interesting point here is that this method (called ‘spectural ground attenuation’) is best suited for “flat ground or ground that slopes constantly”. It is less accurate for ground in valleys between sharp rises(ie. where there is sharp differences in topographic features). Also, I have not seen any place where there is an assessment of ‘echo’ with wind projects. I do know that in our area there is a proposal for a project of 26 turbines within about 1.3 km of the NIagara Escaprment (300′ limestone wall) and the proponent has expressed some concern about the potential for echo but does not have any way to assess it. Topography is so varied how can you measure it with models ? And the vegetation topography changes from season to season, location to location here and year to year. New buildings/structures go up and others are torn down. Rural Ontarians are getting a method/ computer model hose job done on them. Those models were developed for audible sound. Low frequency noise can “bend” around obstructions. Another point is that they (Wind Companies, engineering companies) have offered no proof that they actually use the attenuation parameters for hills and other obstructions. Yes — they are in the model — but are they used? They offer only summary data — not the methodology. Also — a very small error at each point (say 1 or 2dB) actually measured can produce an error of between 15% and 125% of the noise being measured — in large arrays — say 10 to 20 wind turbines. My understanding is that they estimate a few points — then “fill in” the model by guesswork and calculation. Do recall that these studies are published in advance of construction — so there are no measurements — just guesswork. and they use dBA (audible noise) — not dBC — the low frequency evaluation measurement technique. …and yes I do have the engineering math to do an evaluation… but there is not much to evaluate as most of the data is “made up, estimated, faked — whatever you want to call it — it’s guesswork. I don’t believe they bother taking topography into account. I don’t recall seeing it in any regs. I can see how it could have a definite impact though! The ISO Standard for calculating the noise level does have a means for handling height (altitude) and obstacles. However, I have never seen a situation where the informatio was used. So to summarise, the Ontario Government is lying. To lie — one has to know and understand the truth. Do you give them that much credit? A huge wind turbine was just put up across from my home in the Forest area. It looks closer than 550m. How can personally I verify the distance?